It is so easy to look at someone else's story and see the end result. It's impossibly simple to believe only the good about others but the worst about ourselves. Perhaps that's the human condition - giving others endless grace and giving back to ourselves the opposite. Yet, the journey is never as simple as it seems from the outside. Success is not born overnight. There's no race to a finish line. For any of us. And beyond that - there is no one-size fits all definition to success, definition of the finish line. There is no one journey that we all must take. We have the opportunity to peer into others' lives in this voyeuristic culture of Instagram posts and Facebook albums, but it so rarely tells the beginning and middle. Just the end: the developed picture. My pretty Instagram picture right now is this: a full-time business-woman/calligrapher/entrepreneur. Time to read. Time to cook. A doctor husband. Life in a big city. Clients. Two cats. My Instagram picture looks like I've made it. It seems like something I always wanted. It seems like it happened overnight. Less than a year ago, I was at a job I absolutely hated and I was living a life that seemed very out of control. I don't have words for how much I hated that job, but it was a hair shy of all-consuming. Every single day I felt sick before walking in to the office. I counted down the minutes until I left. I thought if I had to talk to my boss, or my colleagues, for one more second I would explode. I plotted quitting endlessly. I talked about it until my husband asked me to please stop. Though it contradicted my complete hatred of the job, I had maxed out my vacation accruals and somehow not used any of it. HR kept calling to tell me I needed to take a day off or risk losing them. It had destroyed my mental well-being and I was trying to take refuge in external things like my small business. I felt that I was in the job because my husband's medical school necessitated I provide for us, try to pay down our collective student loan debt, and that I couldn't afford to do something else with any pay cut. I knew that the job wasn't financially enough either. We were so financially far behind our peers who were buying houses and cars. We had massive loan debt from medical school and undergrad, interview season with a $10,000-20,000 burden approaching (all out of our pocket), a car on the verge, an upcoming move, the desire to one day own a home and have children. I needed to do more and make more. And a small business was the only way I could see that. I slept 4-5 hours a night. Fitfully. I woke up every morning with a pounding heart. My routine was timed to the minute. I worked from 5 am to midnight every day. There was absolutely no room for variation. If something interrupted my schedule - a computer error, a printer glitch - I would burst into tears. When I got new emails, I felt like they threatened that final thread I was hanging by. I told my husband not to speak to me when I was working because I just had no space for anything more. But I was always working. My apartment was such a mess that I, a formerly neat person, would slide piles of things to the side to get to the next pile of work. The cats had to step over paper piles. We didn't vacuum for a month straight. I worked 85-100 hours a week. My husband, who works an average of 90 hours a week would ask me to please spend time with him. He was struggling with depression caused by the high-pressure and burnout of medical school and I didn't have the patience for it. We used to argue over who was having more stress or a worse week. I didn't cook. I didn't clean. I took one 1/2 day on weekends when my husband and I would do as long of a hike as we could stand and then return, exhausted, to get back to work. There was nothing healthy going on with me. I wasn't eating well. We had the same meal for dinner every single night, of every single week, for months straight. My complexion had turned completely awful. I lost a healthy glow and felt pale. No manner of skincare products worked. Sometimes I just sat on the floor in a panic. I became afraid of the fire alarms going off when we cooked. I feared heat waves or cold snaps. Going grocery shopping stressed me out. Traffic made me panic. I'm not really sure why I felt like working myself to the bone would chase out the bad in my life, but I did. I was working so hard to erase the rest of what was going on, without the ability to see that it was making everything worse. I thought that my side business could make up for so many things that were seemingly out of my control: my low-paying day-job; my husband's student loan debt; rising rents; a spouse's depression; the lack of control that comes with following a spouse through medical school. And so, while my business grew, nothing about it made me happy. I experienced for the first time what complete burn out felt like. Each new project felt so difficult to complete. I lacked inspiration or drive. But I kept going. My husband kept telling me: we don't need more money if it destroys you. But I wore that exhaustion like a badge and my business grew because I was giving it every last thing I had. It's interesting. You have your whole life to make a business grow and work. You have years and years to become successful at something. You can't take back destroyed friendships. You can't get back damage you do to your body. You can't unhurt a spouse. You cannot rewind. I'm not sure why we choose, in so many cases, to rush to some non-existent finish line when we can take our sweet time getting there and enjoy the run. When my husband got a position in Chicago and an income for the first time in five years, it was apparent to both of us that I needed to quit either my day job or my side job. There was no longer a way for me or my husband to operate at what we'd been attempting back in Oregon. And so, out of mostly necessity, I quit that day job to move across the country. Relief flooded over me like waves off of a wake. And so starts that pretty Instagram picture. I am not at the end of anything. With any luck I am at and will often be at the beginning of something: growth, a journey, a learning experience. I feel those old feelings biting at my heels almost constantly: you have to work harder, you have to make more money, you have to grow this business, you have to work hard to maintain control. But if the past three years were any lesson, I know that I have to kick back at those monsters on my heels because outrunning them never works. You just end up collapsing before they devour you. The next time you see the pretty picture, love the pretty picture, but love harder what went into making it happen or what's going into making it happen every single day. Love that voyage that brought the picture to you. It is remarkably hard to wade through the sea of paper good options and figure out the best possible invitation for your one wedding day. There's something a bit easier about florals, catering, venue, and wedding dress. Even though there are a ton of options in those categories, you usually have a vision of those pieces from your (possibly life-long) research. Paper is a bit harder. You've never had to send out any invitation in paper form to anyone. How do you navigate the world of paper, finishes, edging, script, and more! I'm here to help you get everything defined. Sometimes starting broad and identifying a simple category of invites is helpful to get you on the right track to an invite designer or calligrapher. Once you have your keywords ready, you can let the googling begin! No more stationary confusion. skipping the honeymoon altogether and buying a home instead? If so, what kind of invitation suite is right for you? Focus on things like clean typography, relying on textured papers to speak rather than an abundance of details like wax seals or ribbon. Opt for classic black and white or a neutral color palette. Explore having a minimal crest or wedding heraldry defined for you that you can use across your wedding paper goods. If so, what kind of invitation suite is right for you? Focus on pieces that incorporate a ton of personality and fun into your wedding - think about custom heraldry that symbolizes your romance and pets; personalized details like an invite featuring illustration, watercolor, or non-traditional wording. Think about add-ons like boutonniere tags, envelope liners, pretty envelope calligraphy, and hand-torn paper. If so, what kind of invitation suite is right for you? Focus on luxe details like double-thick paper in classic cream. Think about adding some letterpress or foil detail to your invites to make them match your wedding feel. Nix the handmade papers and torn edges and keep things straight and clean. Work in a venue drawing or a classic monogram. If so, what kind of invitation suite is right for you? Focus on many little details that'll catch your guests eyes and prepare them for your lovely wedding day. Think: handmade paper or hand-torn edges, beautiful silk ribbon, floral liners or floral illustrations, adding a welcome note or a quote, lots of calligraphy in gold, white, or blush, wax seals with your custom calligraphed monogram. If so, what kind of invitation suite is right for you? Focus on elements that really speak to you and your values. Perhaps that handmade touches like hand-written envelopes and handmade paper. Perhaps it is including a sprig of rosemary in every invitation suite. Perhaps it's dyeing your own ribbon to wrap the invitations in. When we think about wedding invitations today, we jump right in - ordering photo Save the Dates and contacting an invitation designer who is well versed in Illustrator and Graphic Design. We may not be sure how they craft our perfect invite, but with their help we get our wording sent off, images and motifs approved, and a couple months later our guests send in an RSVP. 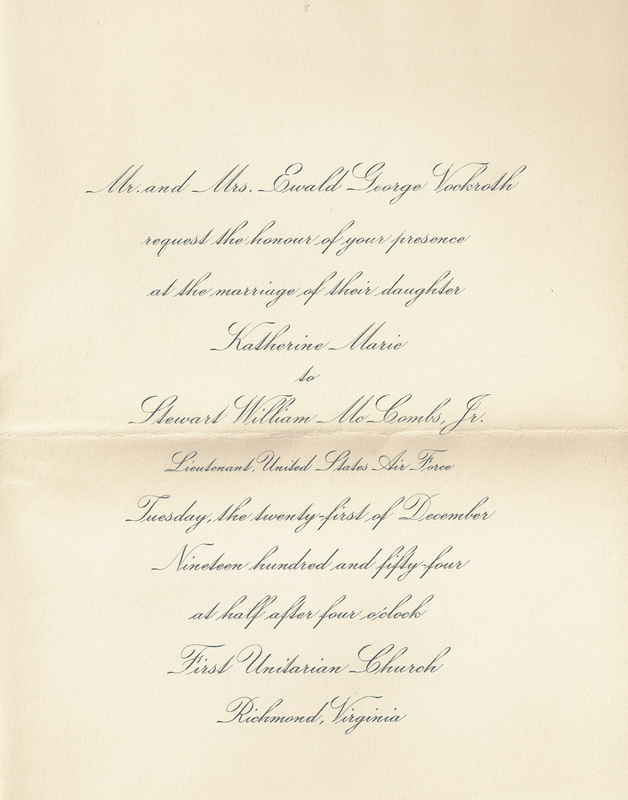 There's little to remind us of what wedding invitations used to be until we start looking at invitation wording (which is often very formal, strict, and sometimes feels antiquated). Perhaps a glimpse back happens when you consider invitation addressing (write out the apartment without abbreviations or nix the woman's name on the envelope "Mr. and Mrs. John Smith"), but that's usually as far as your look-back goes. On to planning the signature cocktails. But, before you jet off to cleverly name the "Hers" Moscow Mule, there's a whole world of interesting information out there about wedding invites. A lover of nostalgia and paper-history, I can't help but share. It's all the more interesting when you consider calligraphy's origins are deep and not just limited to today's Instagraming modern scripters. Did you know that prior to the invention of the Gutenberg press, there was a town crier that announced you were getting married? Someone literally walked through the streets screaming out the news - like a talking newspaper that you caught the news from while tossing out your chamber pots or scrubbing clothes on stones. Ya know, normal 1400s things. If you could HEAR the wedding announcement, you could attend. Try to plan that wedding - there's no entree selection RSVP cards with that method or "no kids please" ceremonies. In the middle ages, basically no one could read, so wedding invites (if they had been scripted and sent out) would have looked like pieces of art and been unreadable by your guests. Calligraphy was a skill that the monks alone had mastered and nobility (with the gift of literacy) would commission their work by monks. Those hand-calligraphed pieces could be sent out to other nobility. In the 1600s, printed type (pressing lead type onto paper) came about and those town criers lost their jobs. Newspapers could be distributed that announced information like weddings. Blame the 1600s for newspaper wedding announcements. All hail the mid-1600s when someone figured out how to engrave. Engraving is a method alive today and is usually your most expensive method of printing. How curious it was the only method back in the day. Engraving is not only gorgeous, but really cool. Engraving back then meant an artist or calligrapher would hand-write text in reverse (image that, fellow designers) on a metal plate using carving tools and then that metal plate would be pressed into paper with extreme force to make the "engraving" or impression. Because text was smudgy as heck, you'd then lay a sheet of tissue paper over the engraving to protect smudging and off they went! The neatest thing? This is still used today. Ever received a formal invite with tissue paper laying over the invite? That's why! Smudge-free and from the 1640s. Traditional wording was really an origin of this time and each guests formal name would be engraved onto the invitation at the top (ultra-customized). In the 1800s, like everything else, the Industrial Revolution changed it all. Easier, cheaper, mass printing methods emerged and there sprung up the idea of mass-market wedding invitations. The invites still couldn't go by post and were often delivered on horseback (what an entrance!). This is where the idea of outer envelopes emerged. The outer envelope protected your inner invitation and inner envelope from damage whilst on horseback. Today many brides use inner and outer envelopes and it's considered very formal. Nice to know it came from an issue with horse dirt getting all over your pretty goods. It's post WWII and Emily Post pops up and tells every person they need appropriate etiquette wedding invites. Thanks Emily! Thermography enters the scene which allows raised type (like engraving but much cheaper) and now everyone can have a pretty and less expensive invite. Thermography is referred to as "poor man's engraving" which is understandable considering the insane engraving prices. Today we've bucked basically all tradition and people are ordering wacky and non-traditional designs off of Minted and emailing out their RSVP cards or their entire invitation, but everything has it's roots in the original traditions. Maybe you don't have a town crier, but most brides like a gorgeous invite and some formal addressing that harkens back to horseback delivery times. 5:10 P.M., arriving New York at 7.02 P.M.
Our wedding is to be on Thursday the tenth at half-past twelve, Christ Church Chantry. Of course we want you and Jack and the children! And we want all of you to come afterward to Aunt Mary’s, for a bite to eat and to wish us luck. You can't have a wedding without the guests receiving an invitation to the day, and unless that guest is being invited by email alone (relatively uncommon), the bride will likely have a paper copy of her invitation suite. A photographer should always make sure to photograph those details and the bride should always make sure to provide her paper goods to her photographer. The paper ephemera associated with a wedding can be as important as (and even as expensive as) a wedding dress or a wedding band. If you're shelling out for gorgeous scripting and pretty papers, it'd be a shame if a photographer missed this part of your big day. Invitations also set the tone for your event. To include the paper as book-ends to your wedding album and coverage is only natural. But so often, an invitation suite is captured sloppily, or even worse, not captured at all. So here are a few tips on how to style invitation suites and how to make sure you get those pretty paper details captured! A camera (iPhone works fine for social media shares, but for any professional photographs you'll need a DSLR or film camera). I personally use a Canon T-series DSLR. Styling board or neutral surface without a distracting background. My favorite styling board is the Heirloom Bindery 2-Color Styling board. I chose French Blue and Light Linen. Vintage stamps or pretty Forever stamps. I love Verde Studio on Etsy. Props! Silk ribbon, florals, greenery, or wax seals make lovely additions to an invitation suite. Natural lighting. Photograph in natural lighting, but not direct sunlight. Minimize shadows and deliver as much light as possible using reflectors or simply a white sheet of poster board/cardboard/or large white sheet of paper. No need to use flash! Don't fall prey to the idea that you need to capture every single piece in one photo. Simplicity helps draw the eye to individual pieces and can create an emotive image. A crowded image, like the one above, is so busy, that the eye doesn't know where to look. This is similar to mistake number 1 (overcrowding), but applies specifically to prop usage. In the image above the following props were used: silk ribbon spool; vintage stamps; rings; petals, flowers, wax seal stick, wax sealer. Using each of these props doesn't make a lot of sense for the narrative of the image. A wax sealer is pretty, but the invite doesn't have any wax added to it so the wax seal feels out of place. The ribbon would be better used alone or tied around a piece. Vintage stamps make a lot of sense as the envelopes do feature vintage stamps. A flower always makes sense and is lovely but has more impact alone. This is a big pet peeve of any OCD and Type A bride and calligrapher out there. Crooked pieces in the image makes everything look sloppy and unprofessional. use a ruler or a sheet of paper with a straight edge to make sure you're styling everything straight across the board. With your camera parallel to the styling board (held above it and held straight) you'll avoid a lot of angle issues that make paper appear crooked when it isn't. A bride's wedding dress is commonly hung and photographed on a beautiful hanger with gorgeous lighting for her wedding album. When a photographer photographs an invitation suite, often they lay rings over the invitation suite and petals and obscure the art. Calligraphy and invitation design are as much art as a wedding dress. Don't cover them up with other pieces! Let them shine. Using less props and props that make sense makes everything stand out more! Make sure you're thinking about the flat lay as a story rather than just a last minute shot. Everything in the image should contribute to the story of the wedding and the invitation suite. Evenly spaced goods makes each piece stand out (can you sense a theme). With the image above, my eye is drawn immediately to the invitation and pretty envelope addressing rather than scanning an overcrowded image, trying to find something to visually focus on. Be sure to capture texture if the paper goods are textural. A lot of decision making, cost, and thought goes into the feel of a paper suite. Not capturing the texture is ignoring an entire piece of the invitation suite that was likely very important to the bride! Don't forget to photograph: vow books, vows, place cards, programs and more! Each paper good contributes to the beautiful day and deserves to be photographed! Want to practice? I sell practice suites in the shop!